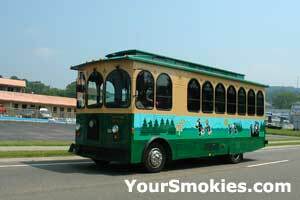 Pigeon Forge Tennessee: the vacation and getaway capital of the TN Smoky Mountains. With thousands of cabin rentals in Pigeon Forge, chalets, Bed and Breakfast establishments, hotel and motels or camping and RV sites - whatever your wants, needs or budget there is a place for you and your family to stay in the Tennessee Smoky Mountains. Pigeon Forge is not only the best place to stay for cheap cabins or luxury cabin rentals in the Smokies, it is the entertainment capital of the Smoky Mountains with more to do. Stay a week or stay a month and you still can not do everything Pigeon Forge TN has to offer. 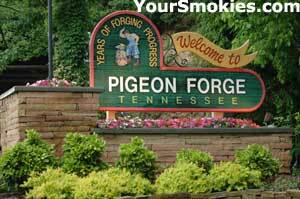 Pigeon Forge is located in north east Tennessee and is the gateway to the Smokies. It is surrounded by the Smoky Mountains National Park and the legendary Smokies areas of Sevierville TN, Gatlinburg TN and Wears Valley which borders Townsend by Cades Cove. This historic city has grown into the Smokies tourist and entertainment center boasting beautiful outdoor parks, legendary amusement parks such as Dollywood, water parks, championship golfing, Indoor and outdoor go cart racing, NASCAR Speed Park, live comedy music, drama and acrobatics in the many theaters, museums, arcades, laser tag, theme rides, interactive movie theaters, aquariums, petting zoos and of course the most visited park in the US - the Great Smoky Mountains National Park are all in or minutes away from Pigeon Forge Tennessee. All year long there is something to do in the Pigeon Forge TN. From Winterfest with its millions of holiday lights spread throughout Sevier County which dazzle visitors with a rainbow of colors and fascinating displays to lazy summer days rafting or fishing on the Little Pigeon River or perhaps enjoy a picnic in the natural beauty of the Great Smoky Mountains National Park. Spring in the Pigeon Forge Smokies awakens millions of wild flowers from winters sleep along with the newborn deer, rabbits, bear cubs and more. Flowers and trees are blooming everywhere as the days temperatures are in the 60s and 70s - perfect for hiking, biking, fishing or just spending a lazy day in the hammock or playing an exciting game of golf. Summer starts with a riot of color when the rhododendrons are blooming in the hills and valleys of the Smoky Mountains and by now all of the water parks, outdoor attractions in Pigeon Forge are open and the white water rafting is perfect for a summer afternoon. The fall colors in Pigeon Forge should not be missed and don't forget to shop until you drop in the hundreds of outlet stores with their annual Christmas sales and extra discounts. Cool nights mean its time to gather around the fireplace in your cabin at night and decompress from the day's adventure. Winter turns the Pigeon Forge Smokies into a Christmas wonderland from the beautiful decorations to the gentle dusting of snow on the Mountain peaks. No one can guarantee a white Christmas due to the mild winter temperatures of Pigeon Forge but you have to come prepared as a few inches of snow during the winter is possible. Valentines Day ushers in sold out crowds who love the peaceful beauty of the Smoky Mountains in late winter and the romance of the Pigeon Forge Smokies the most popular place for couples to get married and honeymoon in. Pigeon Forge is a restaurant goers' paradise with hundreds of restaurant packed into the city limits and hundreds more only minutes away. Pigeon Forge features plenty of fine restaurants, steak houses and seafood restaurants - don't miss the locally caught fresh trout! You will also find plenty of great places serving down home barbecue, country style southern cooking, and ethic foods from Chinese, Mexican, Indian and more. Want to dine in one of the many major chains such as Applebee's, Olive Garden, Outback, Calhouns, Roadhouse, Hard Rock café, Cracker Barrel Old Country Store, Atlanta Bread Co Bakery Café, Bennett's Pit Bar-B-Que, Shoney's Family Restaurant, Red Lobster? These major chain restaurants as so many more are in Pigeon Forge Tennessee or just minutes away in Sevierville or Gatlinburg. Maybe you want to be entertained while you are eating so you want to go to one of the many diner theaters in Pigeon Forge. Dolly Partons Dixie stampede is the all time favorite featuring exciting live entertainment and good food but there are plenty more diner theaters serving food alongside family safe entertainment. Perhaps you are looking for a quick bite right away at one of the kids favorite fast food restaurants. Well you will find plenty of fast food all throughout Pigeon Forge so you won't have to drive far to get your favorite burger, fried chicken or pizza. Stay close to the town of Pigeon Forge and you can even get a delivery of your favorite pizza (hold the anchovies please) to your cabin! With beautiful romantic honeymoon cabins or large cabins and lodges that can accommodate the whole wedding party and a host of wedding chapels to choose from, Pigeon Forge is the perfect wedding and honeymoon getaway location. Even couples who have been together for what seem like ages say there is something in the Smoky Mountain air that helps rekindle old flames. Those romantic walks in the park or a fine candle lit dinners in one of the hundreds of restaurants in Pigeon Forge for your dining pleasure didn't hurt. It might have even been that fine imported perfume or that beautiful lingerie you bought at one of the hundreds of outlet stores selling top designer names at bargain basement prices. Maybe it was just the quiet time you spent watching the sun go down and the millions of stars twinkle above you while you are both relaxing in the hot tub and looking out at some of the most spectacular views of the Pigeon Forge Smoky Mountains. What ever it is, you know you will want to come back to the Pigeon Forge Smoky Mountains as often as you can for as long as you can. Many of the people who come here decide that they too want their own piece of the Smokies so they choose one of the many real estate brokers and agents in Pigeon Forge and buy a cabin or chalets for their own vacations. Some even buy one or more cabins as an investment which can generate income from renting the cabin or chalet to the many tourists that come to Pigeon Forge looking for vacation accommodations. As property values keep going up in the most desirable areas in the Smokies, owning a cabin or chalet in Pigeon Forge Tennessee can be a very wise real estate investment.